Not all products may be certified Kosher. Please check with manufacturer to verify certification. 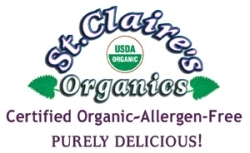 St. Claire’s Organics® makes the finest certified low-carb organic candy. We manufacture GREAT tasting healthy candy! Our manufacturing facility is dedicated Allergen-free. This means our candy is Wheat-free, Gluten-free, Dairy-free, Casein-free, Soy-free, Egg-free, Peanut-free, Tree nut-free, Corn-free, and Fish and Shellfish-free. KOSHER ORGANICS GUIDE is a ground-breaking approach to healthy living by providing on-line information on healthy kosher foods and eco-friendly products. Bringing healthy products to kosher consumers and beyond is our passion. It is one thing to list companies, but the objective of THE KOSHER ORGANICS GUIDE is to provide an online environment where consumers and companies can connect, collaborate and GROW. We are driven by a desire to make a difference. That's why we find joy in work that makes peoples lives' healthier, affects positive change and helps protect our planet. We believe that doing good is not only good for the soul, but also good for business. Our mission is to build relationships with people and for organizations to become a source of inspiration while providing information about the benefits of a healthier lifestyle and global sustainability. reliance on the Kosher Organics Guide or information contained therein. Although the information provided to the Kosher Organics Guide at the time of listing is believed to be correct, listing on the Kosher Organics Guide is not intended as an endorsement or guarantee from the Kosher Organics Guide that the information is correct. 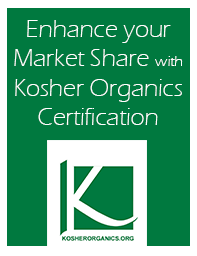 The Kosher Organics Guide strongly recommends that the products’ information and organic and natural certification status be confirmed with an accredited certifier before completing any purchases or transactions.